Less than three months after unveiling its free, fast and easy video-calling software – Logitech Vid™ – Logitech announced its one millionth registered customer account. Vid dramatically simplifies video calling by offering a streamlined setup and a simple, intuitive interface. In fact, you can set up Vid in fewer than half the steps required by the major instant-messaging programs. Continuing in the company’s mission to help you and your loved ones connect face-to-face, Logitech Vid is the latest in a series of Logitech innovations for video calling, including 720p HD local video-capture and Carl Zeiss optics – all available with the Logitech® Webcam Pro 9000. 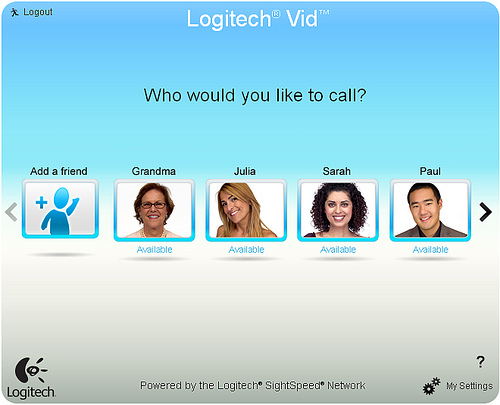 Powered by the Logitech SightSpeed network, Vid is a reliable source for high-quality video calling and is compatible with PC and Mac® computers, as well as stand-alone and embeddedwebcams. Vid is available for download at www.logitech.com/Vid.